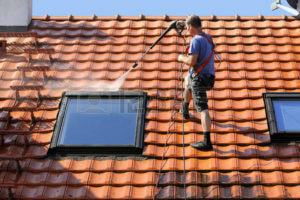 Summer is just around the corner, and it gives you enough time to clean the roofs and maintain it in good shape. Summer is the perfect time to clean the piles of leaves cluttered in your gutter and make sure your roof is ready to go for another year. The accumulation of algae and mold shortens the life of your roof and decreases the curb appeal of your home. To prolong the lifespan of your roofing in San Antonio throughout the hot summer days, here are few tips that every homeowner must follow. Choose summer days with temperatures between 60F and 75F to get your summer cleaning job get done right. Use plastic sheeting to cover plants beneath the roof to keep chemicals off from them while cleaning. Remove moss by scraping them gently using a standard towel or stiff brush to prepare your roof for chemicals. Gutters are the main component of regular roof maintenance, so make sure that they are in good working condition. Clean them at least once a year to save money on a long run. Moreover, summer is the perfect time to carry out any small scale roof repairs or replacement. If your roofs need replacement or repairs, then bright sunny days are the ideal time for the same. Any major roof repairs and large-scale roofing projects should be done under the supervision of roofing professionals. So, talk to your San Antonio roofers now to enjoy the beautiful summer weather under a clean and safe roof.